Originally broadcast thirty years ago, The Box of Delights became an instant classic (it was awarded three BAFTAs in 1985 – Best Children’s Programme, Best Video Lighting and Best VTR Editing) and has remained an ever-present staple of many people’s Christmas viewing. It was adapted by Alan Seymour from the novel published in 1935 by John Masefield. The book was a sequel to The Midnight Folk which had been published in 1927 and also featured Kay Harker. Other characters who return in The Box of Delights having first appeared in The Midnight Folk include Abner Brown and Sylvia Daisy Pouncer, so it’s intriguing to wonder whether the BBC ever considered adapting both novels. Kay Harker (Devin Stanfield) is returning home for the holidays. On the way he meets a strange Punch and Judy man, Cole Hawlings (Patrick Troughton) and two even stranger clergymen, Foxy Faced Charles (Geoffrey Larder) and Chubby Joe (Jonathan Stephens). Both Cole Hawlings and the two clergymen seem to know a great deal about Kay. By magic, possibly? Quite why Charles and Joe decided to con Kay out of half a crown by playing Find the Lady (and then presumably steal his purse and watch for good measure) is a bit of a mystery. Did Abner Brown (who we later discover employs Charles and Joe) ask them to target him or was it simply a piece of opportunistic thieving? They also seem to have considerable powers (it’s not explicitly stated, but they appear to change from human form into wolves) and this is apparently confirmed by Cole Hawlings later, when he states that their new magic is sometimes too powerful for his old magic. But Cole Hawlings has something they want – the Box of Delights. It can make a Phoenix rise from a fireplace (a lovely piece of traditional animation) and also brings a photograph to life, allowing Cole Hawlings to make his escape. This is another very impressive piece of work, particularly when the animated mule changes to a live one and then back again. It’s easy to overlook just how tricky that would have been to achieve, especially when working with traditional animation. Nowadays, the effects seen in The Box of Delights could no doubt be easily achieved with CGI, but there’s a certain undeniable charm about the effects they used here. They may seem crude to some people, but they work – and that‘s all that matters. Cole Hawlings tells Kay that “The wolves are running”. He doesn’t elaborate too much on this enigmatic warning and elsewhere there are other oblique messages (delivered by an old lady with a ring who disappears at will and a mysterious man on horseback who tells Kay that “If you see someone … say someone is safe”). At the end of the episode we get our first sight of Abner Brown (Robert Stephens). 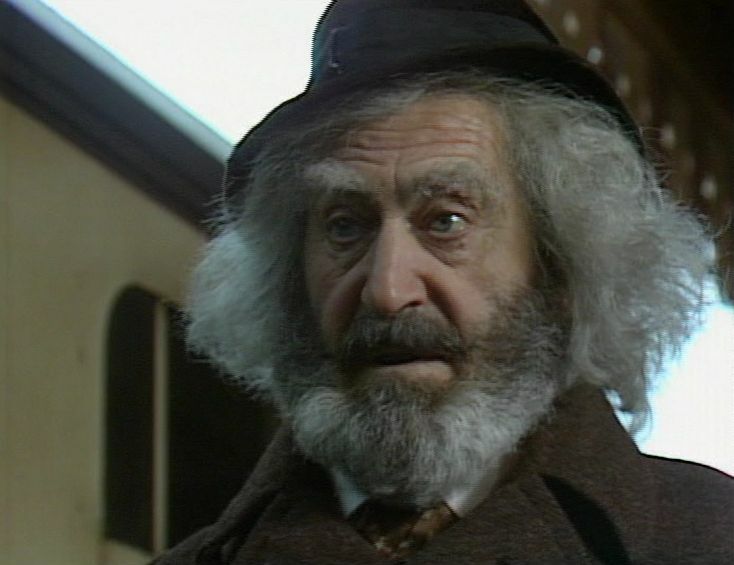 Stephens is, from this first scene, mesmerising and remains (along with Patrick Troughton) the best thing about The Box of Delights. Next Up – Episode Two – Where shall the ‘nighted Showman go? It’s that time of the year when the wolves are running again …..
a great fun tv show. Fingers crossed she’ll enjoy it. It’s a pretty timeless story and does work on several levels. When I was younger, it was the character of Cole Hawlings who appealed the most, now I find I’m drawn more to Abner Brown (and Robert Stephens’ delightfully pitched peformance). Indeed. Stephens didn’t do nearly as much television work as Troughton, but whatever he did was worth watching. Well slightly ahead of schedule i did watch the first two episodes at the weekend with my wife (who remembered it as an 11 year old when first shown) and our 7 year old daughter. They both enjoyed it so i was really pleased. We’ll hopefully finish the series between now and Christmas. Something i hadn’t realised until seeing it again is how all the events are condensed into about two days. On his return from school Kay meets his friends/cousins, goes to the village to summon Cole Hawkins (it’s already dark), watches the punch & Judy show, accompanies his guardian to the station to get the evening train to London and later goes back into the village supposedly to do some shopping. How long do the shops stay open and what time does he go to bed were the questions raging through my mind at this point.